Handicap Calculations....what rounds are included? The handicap is calculated automatically by the app as you play golf. The app will not use rounds played on courses that are Par 3 courses, Executive courses or courses with a par less than 69. Under the section labeled "You," click "HANDICAP"
Then scroll down and you will see a list of all the rounds that you have played. 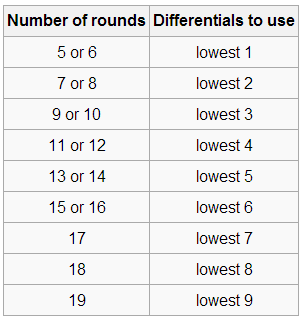 The rounds that are highlighted in green are the rounds that are being used to calculate your handicap.